Puppies are totally dependent on their mothers at the beginning of life. If it falls to you to care for newborn puppies in the first few weeks of their lives, you have a pretty good shot at success if you follow a few basic rules. Understand and meet their needs, and you too can become puppy Mother of the Year. A mother dog knows exactly what to do to care for her puppies, and she's all that they need. She provides warmth, sustenance and passive immunity through the colostrum in her first milk. If the momma dog has had puppies before, you don't need to intervene except to provide her support. Switch her food to puppy formula, which helps provide the extra vitamins and minerals she needs. Give her a warm, clean place to nest, and see to her needs: water, potty breaks, and your devotion. While that's the usual, sometimes a mother dog can't or won't care for her newborns. Then you must step in. 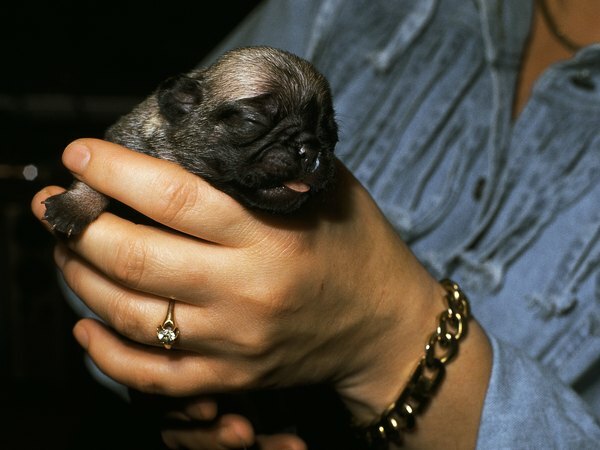 Newborn puppies can't produce or maintain body heat; they must obtain it from an external source. Usually, that source is a furry, warm mother dog, and there's no problem. If the mother dog is absent, you have to carefully provide the heat. If the ambient temperature is too cool or too warm, the puppy's body will be stressed, increasing the chance of illness. Use an electric heating pad, electric blanket or heat lamp, and watch to make sure the puppies don't get overheated. If you are not near a source of electricity, pads that provide heat for several hours when you open the package provide heat longer than a hot water bottle would. In the first week of life, puppies should be kept in a room with an ambient temperature of 85 to 90 degrees Fahrenheit. Reduce the temperature to about 80 degrees in the second week and third weeks, and then maintain it at 75 degrees from week four forward. The mother's milk provides immune-building colostrum in the first week of life, but sometimes a high-quality canine milk replacer must suffice. Consult with your veterinarian on how to bottle feed newborn puppies, and what to feed them. If you do it incorrectly, you could cause harm. Plan on using the formula for the first 5 to 6 weeks of age. Warm the formula before feeding. When each puppy is satiated, gently swab his genital area to stimulate elimination. Seek coaching from your vet on how to provide this important care. Feed the puppies every two hours the first week, then gradually increase the interval between feedings. By about week four, you can begin to introduce kibble by soaking it in formula. Take the puppies to the vet to be checked and weighed every few weeks, or as prescribed by your vet. It's important to be sure the puppies are gaining weight and thriving. A puppy's weight will double or triple in the first few weeks of his life. If a puppy is failing to thrive, it's better to address the problem as early as possible. Most puppies don't see a vet until 6 weeks of age, but orphaned newborns should be seen sooner in case medical intervention is needed. The vet will recommend a worming and vaccination schedule based on the puppies' progress. Be careful not to handle the puppies more than necessary in the first two weeks of life. After that, frequent gentle handling will help socialize the puppies. Don't allow over-enthusiastic children to handle the puppies unsupervised, as they are still somewhat fragile. But as the puppies grow, exposure to new sights, sounds, other (safe) animals and experiences will help them become well-adjusted so they grow to be the happy and healthy dogs they were born to be; all because of your tender loving care. How Long Before a Newborn Puppy Can Defecate on Its Own? Can Chicks & Ducklings Eat the Same Food? How Do Kitten Siblings Play? How Long Does It Take a Newborn Puppy to Stand Up?